The 100 Strangers Project being a learning exercise at its heart, I ventured out into the Helsinki night armed with two reflectors and a flash. After a few inevitable rejections, and having dodged up a couple of side streets to avoid a few inevitable drunks, I set up with a large construction hoarding as a simple backdrop. A couple of seconds later, Pauliina, Kira and Sonja wandered up, as if fated. Pauliina was talking at the time, energetically, and with a bright, somewhat wry smile. Nonetheless it was only with Kira’s encouragement that she passed her drink to Sonja and agreed to shoot. Kira seemed pretty certain that Pauliina should take part, and once “on set” she demonstrated the same forthright presence she had had walking down the street moments before. Surviving an officious interuption from a security guard, we shot for a few minutes before the girls headed on to their night out. They met at school in central Finland. Some years later Kira has moved to Helsinki; Pauliina and Sonja visiting to catch up and enjoy an evening’s revels together. So Pauliina, Kira and Sonja – kiitos! Thanks so much for stopping and taking part! 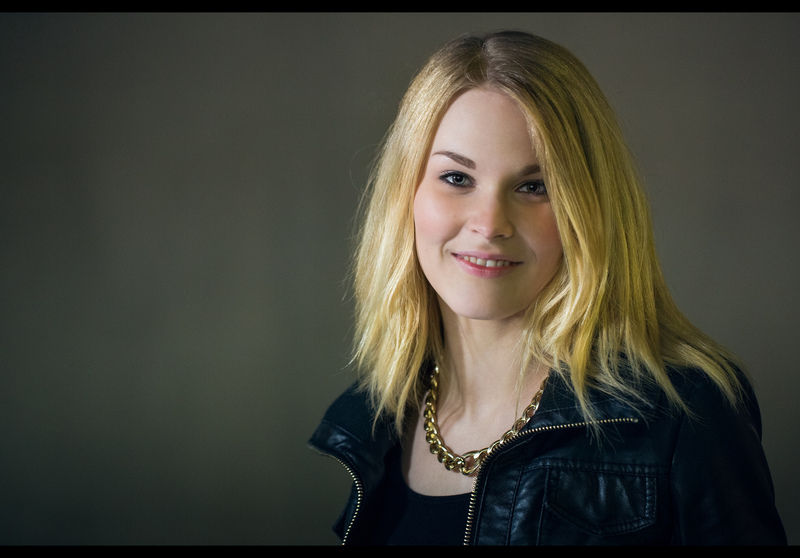 IT was great fun chatting and shooting together, and I hope you like your portrait Pauliina. Night portraits offer a great opportunity to travel with family and still shoot for the project. They also present a wonderful challenge, and opportunity again, in terms of lighting. Normally I’d use a large softbox on a stand for night portaits, as in shots like Martyna’s portrait or even a smaller softbox held like Hanna’s portrait – but travelling with as many reflectors as I like and a single carry on bag, neither solution is desperately convenient. Instead I’ve recently had some success with extra strangers bouncing flash from a reflector as a fill, so I thought on this trip I would try it as a key light instead. Kira is stood ~2m from Pauliina to camera left, bouncing a Canon 600EX-RT on ETTL from a large soft gold trigrip reflector. Meanwhile Pauliina holds a soft gold reflector just below shot. It’s not perfect by any means as a setup, yet I wanted to share it as a milestone along the journey. As a next experiment I’m going to try borrowing bedsheets from my hotel to flash through, like a giant softbox – portable and hopefully easier for a group of strangers to manage together. More anon! This is portrait #80 of my 100 Strangers Project – check out the group page and get involved.